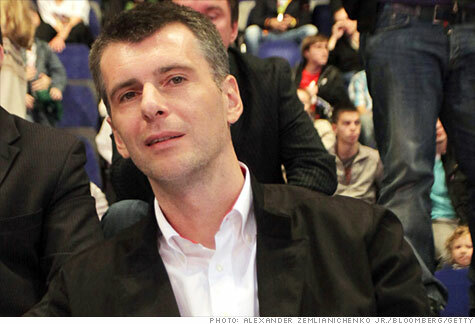 FORTUNE -- In addition to his media ventures, which includes Snob magazine, Mikhail Prokhorov owns the New Jersey (soon to be Brooklyn) Nets basketball team and investment bank Renaissance Capital. It's been reported that he is also working on mass producing an affordable hybrid-powered car in his native Russia. While other outlets have reported on the harassment and even murder of Russian journalists critical of the government, Prokhorov says journalists largely self-censor over concerns of "writing the wrong thing. Fortune: Is it possible to run an independent media company in Russia without Kremlin interference? Prokhorov: Absolutely, and Snob is a testament to that. It's an open forum that encourages discussion. I know that, among the Snob staff, if an article is posted and there is no commentary, it's considered a failure. We solicit all kinds of opinions and no one overrides that in any way. In Russia , the issue of free press is largely a question of self-censorship by the media, when journalists are concerned they will suffer repercussions for writing the wrong thing. It's important that journalists feel they are in an environment where they are protected and free and also decently compensated, which is a big issue in all media outlets around the world today. At Snob, the writers and editors know there will be no interference, not only from the government, but from the ownership as well. I read the magazine like everyone else, once it is published. How independent are your other business ventures from the government? Is it a difficult line to tread? I don't find myself restricted in doing what I want to do in terms of business. No one doing big business can avoid some contact with government agencies, regulators, and policy makers. I imagine this is much the same in any country in the world, especially if you work in strategically important industries and with companies that employ a significant number of people. The government in Russia does not tell me what to do with my assets. Sometimes, if I need assistance on the government level, I can appeal through official channels. For example, when I bought the New Jersey Nets, President Medvedev raised the issue with President Obama, who voiced support for the idea, which is always a nice thing to have going for us. Currently, there is a strong push by the government to develop innovative projects in Russia . I am also interested in this, and have been working on a hybrid car that I think will be good business, but which also fits into the overall vision of where the government thinks the country should be moving. You have been more active in New York than many other oligarchs, who have a bigger presence in London, with your purchase of the Nets and then the expansion of the magazine. Do you see the US as your future home and have you other business plans there? I have no plans to have any other home than Moscow . However, I love to travel, and I'm very comfortable in New York. In many ways, it reminds me of Moscow in its energy and drive. Currently, my only business plans for the US are to complete the Barclays Center arena in Brooklyn, scheduled for 2012, and for the Nets to move into a great new home. And, of course, I would like Snob to increase its US readership. After that, we'll see.